Tiny Swords SMAAASH! is a super adorable, turn-based tabletop brawler that takes inspiration from Rock, Paper, Scissors and Super Smash Bros. Players can pick one of four wonderful characters, each with their own powers, to lead their army of ghouls to victory! 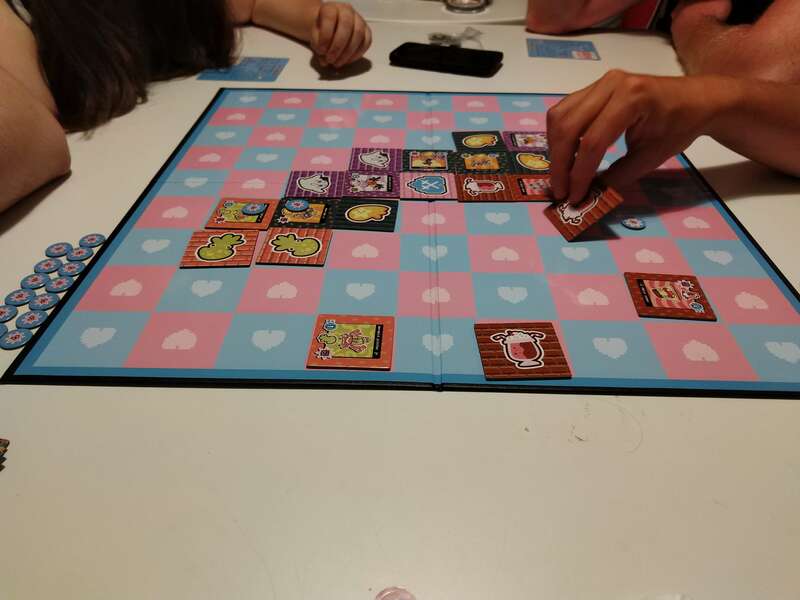 Placing various characters on the board and slowly pushing each other off — the idea is to be the last one standing and to protect your main leader in this family-friendly game. 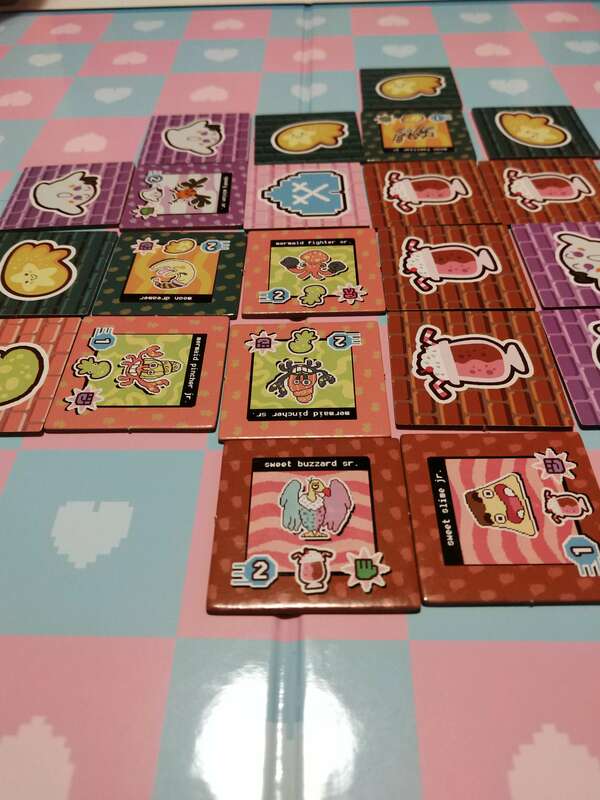 Set in a colorful and wacky world, each player picks a cute looking character, along with their themed army, before starting the strategic game. These armies all get placed onto the board around a central heart with at least two of each player’s characters faced up, while the rest can be faced down. I picked up this game based on the artwork — which is not only cute, but also highly themed around stuff I love… things like witches, sweets, and spooky characters. The game itself is really polished, labeled as ‘cute and chaotic’ — this basically describes the things I want to find in a game I can play with others. Tiny Swords SMAAASH! includes four character cards — each with your leader printed on them as well as their abilities. The back provides you with a quick look at the instructions of the game. Of course, you also get a complete instruction booklet to learn how to fully play the game. There are 24 player tiles — six of each belong to each character and become their army (as well as a leader tile) for the game. 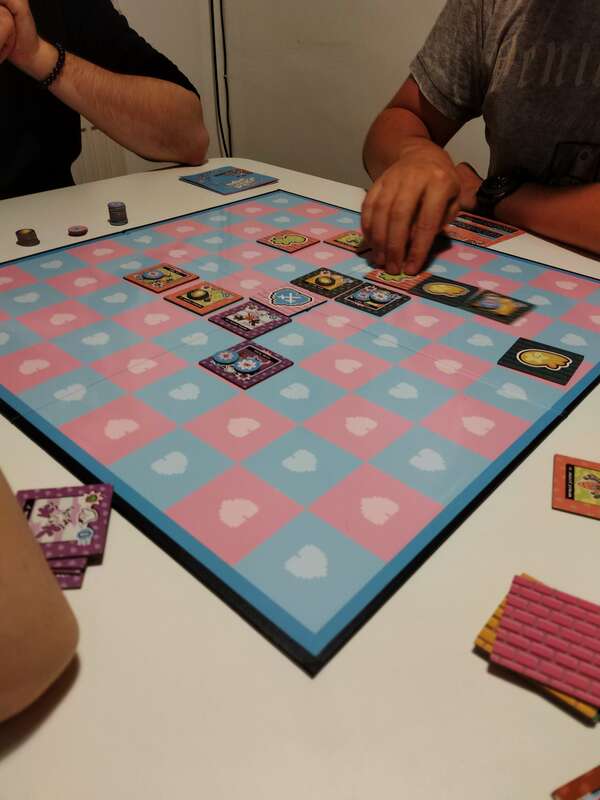 There are four block tiles, which are optional and can be given out at the start of the game or given to the first player that loses, so they can continue to play. There are two heart tiles as well. The game comes with a handful of tokens — damage tokens, action tokens, and moon tokens. Finally, you have the board that the game is played on. Once the army tiles are all placed, each player goes turn-by-turn using two actions. You can either flip one of your tiles over, revealing the monster it contains or turns a monster into a wall that keeps it safe. You can move (up to the amount shown on the tile), or you can attack other monsters — which is primarily what you end up doing in Tiny Swords SMAAASH! Monsters have a rock, paper, or scissors symbol on their card. As you attack other ghouls, you do damage based on which of these is on each card. If you are strong against the other monster, they will take two damage, if you match they will take one, and if you are weaker (IE you are paper and they are scissors) they will take one damage, but so will you. The creature you attack will also be knocked back based on acquired damage — so, more so if they have previously taken damage. If they smash into a wall, the wall tile will flip over revealing the monster below. If they fly off the board, they will die, and whoever you destroyed will gain an extra turn token for the loss of their army member. You can always get rid of all of your damage by turning the tile over and back into a wall — though this will cost one of your actions. You could also move your monsters however many tiles are listed as the number on the monster card. Monsters that are not touching anything in any of the cardinal directions do take damage at the end of your turn, and ones not connect to anything at all (not diagonally or through cardinal directions) will die if flipped up. 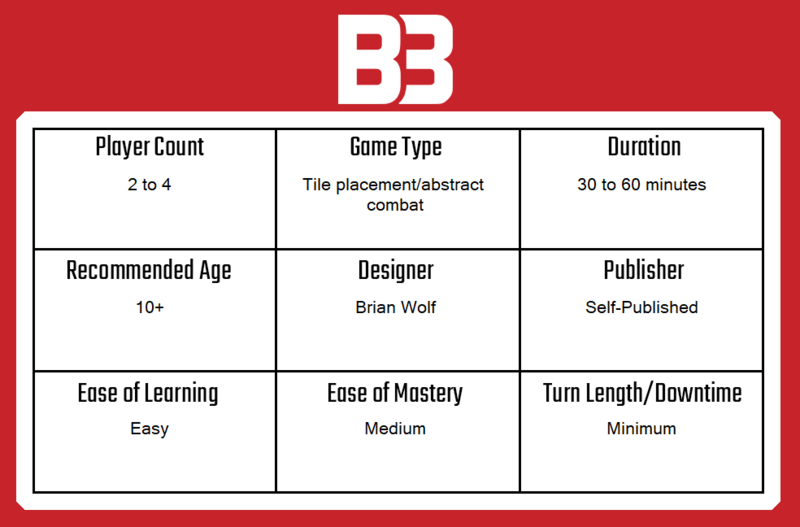 Once you become advanced at the game, you can play with the various abilities each character has. Each seems to have a passive ability that is always active as long as your army leader is flipped over, as well as an ability that will cost an action. These abilities, if used well, can really give you a large advantage in the game, but do make it much more challenging. If you die and are given the wall tiles, you can place unmoveable walls that other players will need to break around the field. As mentioned before, I really love the artwork of this tabletop game. The designer, Brian Wolf, has his own style and it really shines through in his games. I enjoyed the theming of each army: mermaid, spooky, sweet, and moon — as well as the collection of characters that were present in the game. Each of the teams felt really well connected and even their abilities were matching in theme. It did not take us long to completely understand how to play Tiny Swords SMAAASH! (without the abilities). We were quickly smashing each other, turning our tiles to walls, and being pushed off the board. It’s very fun! Smashing through various ghouls, hitting walls along the way, and sacrificing members of your army for extra turns forces you to think strategically to stay alive. There is some planning and thinking that must be done to keep your characters toward the middle of the screen, and to rid other players from the field. When playing with the abilities, it became clear that you really need to make sure everyone fully understands all of their abilities and which characters can really counter the other ones. The game is designed in a way that characters do each have a very unique set of abilities — and there is a character that does an ability that can directly hurt the ability of the other. You will need to use your ability well —- keeping passive abilities in mind at all times — to play with abilities. If one person doesn’t understand, they will struggle greatly and it will make the game feel unbalanced. Once you do understand your abilities well, and have played a few rounds, it is easy to understand what the developer was going for. There is much more planning and strategy that needs to be done, but that just makes the game more fun to play. In the end, I very much enjoyed my time with Tiny Swords SMAAASH! 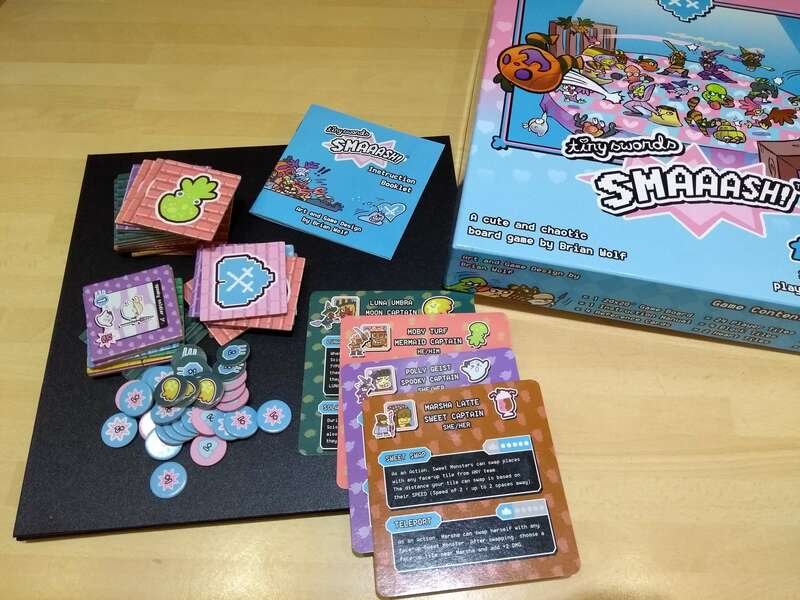 This board game is not just cute — it is well designed from the box it came in through to the game itself. I love the option to let the first player out of the game still contribute through wall tiles as well. The game has personality through its characters, and brings a very fun video game to life. Sliding the tiles across the board is super satisfying as well! Tiny Swords SMAAASH! is fun for everyone — from younger children to adults — and I will be playing it again soon I feel as it is a great game, especially for a few quick plays! You can pick up your own copy on Brian’s website!